The railroad industry has seen volume improve markedly, and CSX stands ready to capture its share of the spoils. Find out how. Railroad CSX (NASDAQ:CSX) has seen its shares climb more than 50% since the beginning of 2013, as conditions in the industry and the overall economy have boosted prospects for the company in particular and the sector generally. With the stock setting an all-time high recently, CSX shareholders want to know what catalysts could send the share price even higher. Let's look at three of the top reasons the rise in CSX stock could be just the beginning of a bigger run. 1. Rising natural gas prices could spur greater coal demand in the U.S. and abroad. Two years ago, natural gas prices fell to their lowest levels in more than a decade. Because of the boom in domestic oil and gas exploration and production, a glut in natural gas led a significant number of energy-intensive businesses to reconsider their fuel sources. Many utilities saw low natural gas prices as an opportunity to sink billions into converting electricity-generation plants away from coal, and that in turn sent the coal mining industry into a tailspin. Environmental regulation also played a role in the move away from coal, with regulators seeing natural gas as a much cleaner-burning fuel for curbing pollution. As a major transporter of coal, CSX felt the impact of low coal prices. Its share price didn't plunge to the same extent as that of many coal producers, but impressive gains in previous years came to an abrupt halt. 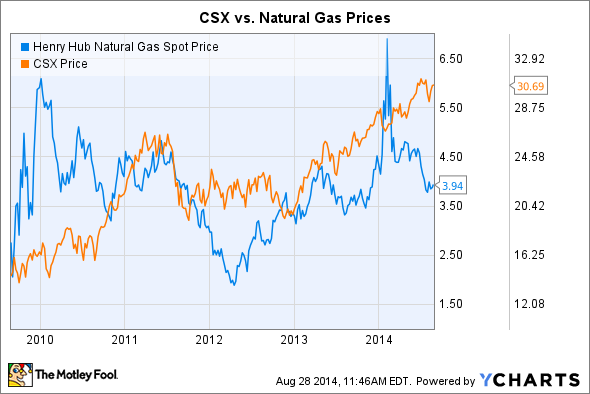 Natural Gas and CSX Price data by YCharts. Since then, though, natural gas prices have steadily increased, as more commercial and residential energy consumers shift their usage away from other fossil fuels to take advantage of still-attractive conditions in the natural gas market -- driving demand higher. Rising gas prices have helped support the struggling coal market, with the potential not only for domestic utilities choosing to rebuild their coal inventories but also for foreign buyers to look more seriously at importing U.S. coal to meet their own energy needs. From its central position serving the coal-rich Appalachian region, CSX will inevitably benefit from any recovery in coal. 2. The energy boom should continue to bring higher shipment volumes on crude and necessary chemicals. Even though coal has historically played an important role in CSX's success, one cause of coal's recent problems has also had a silver lining for the railroad. Record domestic oil and gas production exposed the lack of infrastructure available to transport new production to market hubs, and many of the most successful oil and gas shale areas are in remote locations where pipelines don't yet exist to help move products to market. In response, CSX and peers Union Pacific (NYSE:UNP) and Norfolk Southern (NYSE:NSC) have started moving crude oil by rail, and the resulting demand has helped offset shrinking volumes of coal shipments. Pipeline developers have proposed a number of projects designed to help alleviate supply roadblocks. But those projects take a long time to develop, and rail traffic related to petroleum products shows no sign yet of slowing. 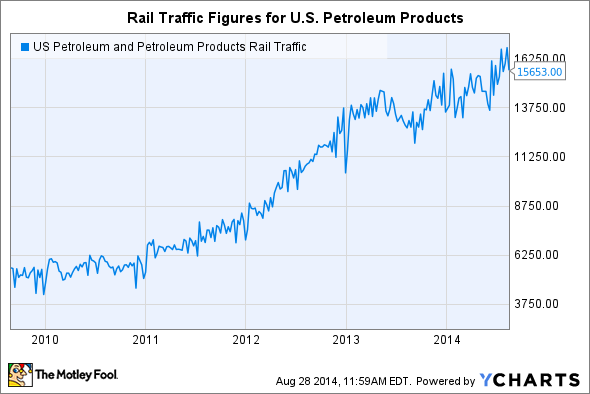 U.S. Petroleum and Petroleum Products Rail Traffic data by YCharts. Moreover, CSX and other railroads have discovered that oil and gas companies need regular shipments of supplies including fracking sand and oil-field chemicals in order to support their operations. That gives CSX the opportunity to carry full loads on its trains in both directions, eliminating the need for costly one-way trips at less than full capacity. As long as the energy boom lasts, CSX is positioned to capture its share of the resulting demand for its transportation services. 3. Expansion in infrastructure could boost its capacity to serve continued economic growth. Along the same lines, CSX is working to improve its ability to serve customers through a number of innovative projects. In order to help give engineers as much data as possible to maintain safety, CSX has worked on positive train control systems to provide warnings of dangerous conditions. In emergency situations, a positive train control system can also automatically engage brakes and bring trains to a complete stop even without engineer action. In addition, CSX's National Gateway project targets improving the railroad routes that connect the Midwest to key ports in the mid-Atlantic region. As a public-private partnership between railroads, their corporate customers, and the communities they serve, the rail-infrastructure project will make it easier for CSX and its rivals to use double-stack trains and thereby boost their transportation capacity between key markets. Infrastructure projects can be costly, but the creative ways that CSX has looked at structuring those projects help spread out the costs to all those who stand to benefit. As a result, more of the rewards will fall through to CSX's bottom line, and that should give shareholders a positive surprise as those benefits become clearer. CSX investors have generally been happy with the stock's performance lately. But if these three trends keep going its way, then CSX shares could enjoy even greater gains in the years to come.